Labour and Wage Increases - Barking Up the Wrong Tree! As its tomorrow's deadline for strike draws close, organised labour did not attend the conciliatory meeting with the Federal Government's team in Abuja yesterday. It said it was not invited. The Guardian learnt that the organised labour would also not be renegotiating the N30,000 figure but would rather push for the submission of the tripartite committee's report to President Muhammadu Buhari for onward transmission to the National Assembly for legislative action. Workers' unions in the aviation industry said they would embark on the industrial action. The unions also demanded full compliance from members, with a view to grounding flight services nationwide. The unions, in a joint statement by Comrade Frances Akinjole of the Air Traffic Senior Services Association of Nigeria (ATSSSAN), Comrade Ocheme Aba of the National Association of Aircraft Pilots and Engineers (NAAPE), Comrade Temenu Akinola Assistant Secretary General of the National Union of Air Transport Employees (NUATE) and Comrade Abdul Rasaq Saidu of the Association of Nigerian Aviation Professionals (ANAP), said the strike would be indefinite. In an earlier statement, national president of NUATE, Ben Nnabue, insisted the action is "due to the inability of the Federal Government to agree on the new national minimum wage." He added: "All flights operating in and out of Nigerian airports shall be affected by this industrial action." with so much of what is happening. You know, there are factors and there is a court action. We need to consult with our officers who are on ground to brief us properly and take decision based on the information we get." Also, National Public Relations Officer of the Petroleum and Natural Gas Senior Staff Association of Nigeria (PENGASSAN) Fortune Obi said the union, which is an affiliate of the Trade Union Congress (TUC) is in support of the strike. He, however, added: "The central working committee will meet and will take a decision. We will monitor the event and call a press conference. There are ways to go about it. You know our industry is a critical one." 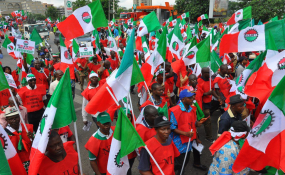 The State NLC chairman, Kabiru Ado Minjibir, said: "I am now directing the entire workers both at federal, state and local governments to embark on a strike action from 12:00 a.m. on Tuesday, in compliance with the nationwide strike declared by the mother body, to press home NLC's demand for N30,000 minimum wage. The workers have decided to match force with force. While the government declared no work no pay, we will also invoke the doctrine of no N30,000 minimum wage no vote in next year's election." The TUC chapter in Oyo State said there is no going back on tomorrow's strike. State chairman and chairman of Public Service Joint Negotiating Council (PSJNC), Oyo State council, Emmanuel Ogundiran, said all arrangements had been made to embark on the industrial action. According to him, there will be no retreat or surrender. On the allegation that labour is being used by opposition politicians ahead of next year's general election, he answered: "If they said we are being used, then let the ruling party use us. But nobody is using us. What is driving our agitation is hunger. Let the government give us N40,000 and see. When you're not doing well as a leader, you will always find excuses. All the excuses are not unfounded." The chairman of the NLC chapter in Cross River State, Pastor John Ushie, said: "Labour is ready to embark on the strike if the Federal Government fails to meet its demand for N30,000 as minimum wage." There were, however, mixed reactions on the looming strike. Mrs. Elizabeth Ugi, a civil servant in Calabar, welcomed it. "We, the civil servants, are the people who boost the nation's economy yet eat so little of it. Our leaders are the ones enjoying our sweat. Enough is enough! The Federal Government must comply with labour's demand," she said. But a businesswoman, Patience Inah, disagreed. "I am not in support of the strike neither am I in support of the minimum wage. Increment in salary will lead to inflation which will in turn affect my business negatively," she argued. But a civil society organisation, Network for Accountability and Transparency Crusade (NATC), condemned the planned strike, despite a subsisting court order. It alleged "widespread speculation in some quarters that some labour leaders have held a series of meetings with a former presidential candidate of northern extraction to insist and reject overtures from government." In a statement, NATC urged "labour leaders to rise above their interests by rejecting whatever overtures have been extended to them by unscrupulous politicians."